Perhaps the most tumultuous week in British parliamentary politics of recent times has left the UK with no clear timetable for leaving the European Union – and barely two weeks to prevent what is widely considered the worst-case scenario: crashing out of the EU without an agreement. The only definite result from four days of frenzied debates in the House of Commons and dozens of sometimes agonisingly close votes is a decision to ask Brussels for an extension of the deadline for Brexit. This could give the UK government an extra three months to reach an agreement – a “deal” – to allow for an orderly departure from the EU. But this raises questions of its own. If there is to be an extension, then how long? The UK government envisages three months, until 30 June. This is because, as the EU has pointed out repeatedly, the European parliamentary elections are to be held on 26 May, and any extension of the Brexit deadline beyond the opening of the new EU Parliament on 2 July would require the UK to elect MEPs for the new term. The UK government wants to avoid this at all costs, partly because of the expense, but also because of the message it could send to UK voters that Brexit might never happen. The decision to request an extension of the deadline at all, however, has an additional downside. It places the UK, not for the first time, in the position of supplicant – requesting a change to the date that the UK Parliament itself fixed for leaving the EU two years ago. And there is a fear that Brussels could decide to offer only a longer extension – of a year or even two years, on the grounds that a whole new negotiation could be necessary. Now it could be argued that this would not be entirely unwelcome to the Prime Minister, Theresa May. The “deal” that she negotiated last summer and which has now undergone some minor clarifications about the relationship with the Irish Republic, has been twice rejected by the UK Parliament by big majorities. But a long extension of the deadline imposed by Brussels could, just, persuade hardline Brexit supporters among Conservative MPs that their cause could be lost. It could – maybe – persuade them, reluctantly, to accept Theresa may’s “deal”. At which point it is worth looking at where we are now. Last Monday, Theresa May made an evening round-trip to Brussels to secure the clarifications on Ireland from Brussels. Before the new information had been formally presented to Parliament, however, the supposed concessions were dismissed by the Government’s chief legal adviser, the Conservative MP Sir Geoffrey Cox, as essentially meaningless. This effectively guaranteed that when Parliament came to vote – for the second time – on May’s departure “deal”, it was once again rejected by a significant majority, even if that majority was not quite as big as before.That was Tuesday. On Wednesday, there was perhaps the most significant vote – when MPs voted that the UK should not leave the EU without a “deal”. This is how they found themselves on Thursday debating whether to ask Brussels for an extension of the deadline. This was passed with a respectable majority of more than 40. But the fate of two amendments to the main proposition offered clues as to what might and might not be possible. One suggestion – that there should be a new referendum on Brexit - was rejected by a big majority. The idea for another referendum is popular among Remain supporters in the country at large, who hope for a different result, but hated by Brexit supporters for the same reason. 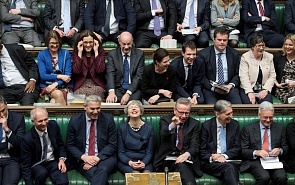 Another proposal, stipulating that any extension of the deadline for Brexit should be limited to three months, was also rejected, but by only three votes, exposing the depth of the division in Parliament. This result was interpreted as leaving negotiating authority – just about – in the hands of the government. A victory for a fixed deadline would have been seen as effectively transferring negotiating authority to MPs. One other observation: the parliamentary votes of the past week have shown that – on Brexit, at least - party discipline has largely broken down. MPs from the Labour Opposition voted for government-proposed measures, and vice versa. Ministers, even Cabinet members (who are chosen from among MPs in the UK system), voted against, or abstained, on government proposals. The Brexit minister argued one position in Parliament, then voted against it! This does not mean – as some have suggested - that the party system has collapsed. It is rather that both major parties are split down the middle on Brexit and MPs are voting according to their personal judgment, or sense of responsibility to their voters. The chaos in Parliament will probably not extend to other issues – but it could mean that, in time, the party system could be weakened. Nor does what has happened over the past week mean that the UK will not leave the EU on 29 March. Pretty much everything remains open. There are three main possibilities. Mrs May could win agreement for her “deal” in Parliament next week at the third attempt, especially if hardline Brexit supporters are scared that a long extension from Brussels places their whole Brexit project at risk. In that case, there could be an orderly departure. It could be, however, that her “deal” is rejected for a third, and even a fourth time and that no agreement can be reached with Brussels on an extension. In that case, the UK crashes out on 29 March with “no deal”. Or it could be that agreement is reached with Brussels on an extended deadline, allowing time for changes to the current “deal” (unlikely), or for the negotiation of a different agreement, currently being referred to as “Common Market 2.0, according to which the UK would refocus its efforts on leaving the EU, but rejoining the wider European Economic Area. Meanwhile Theresa May’s position becomes ever weaker – in that her her failed trip to Strasbourg and the desertion of Cabinet members in key parliamentary votes has diminished her authority still further. But she is also temporarily stronger – because there is no one, on either side of the House, who wants her job at the present moment. Her “deal” is not quite extinct – and neither for the next couple of weeks is she.